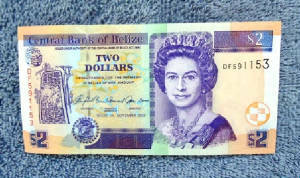 Two Belizean Two Dollar Bills. 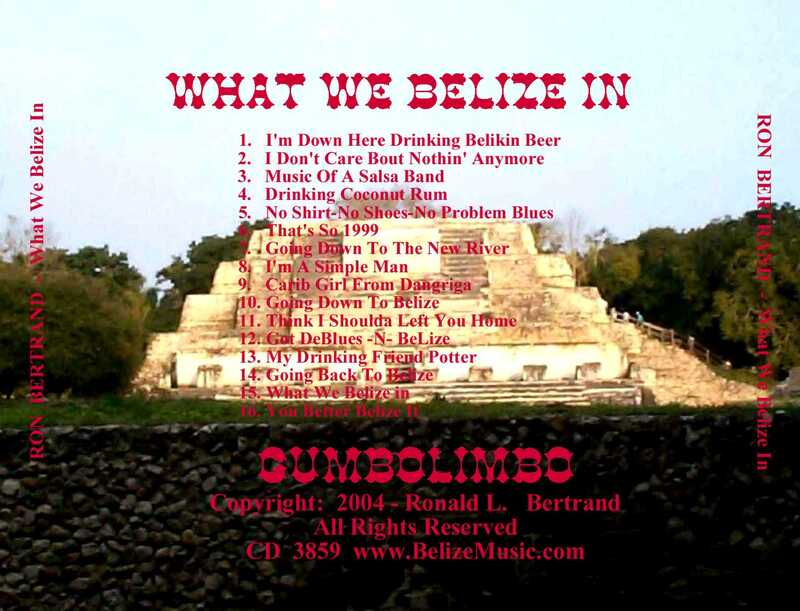 This is the CD, "What We Belize In", produced by GUMBOLIMBO. Ron Bertrand wrote the songs included on this CD while living in Belize on the island of Caye Caulker. If you have been to Belize then you will identify, and enjoy songs such as: "I'm Down Here Drinking Belikin Beer" (The Belikin Beer Song), "Going Down To Belize" and "Carib Girl From Dangriga". To: "You Better Belize It". The $2.95 S&H is only charged per order, not per item. So be sure and order as many CDs as you want and not worry about any expensive shipping charges. Your order will be processed quickly and securely by PayPal in which you do not have to be a member. GUMBOLIMBO is a PayPal verified merchant. This CD Is Also Available For Downloading Or Purchase At Many Other Internet Online CD Stores... Click On Any Of The Store Logos To Go There. Thanks! If you have ever drank a Belikin Beer in Caye Caulker, San Pedro Town, Ambergris Caye, or anywhere within the Belizean interior or any of its beautiful cayes then be sure to get the music which will remind you of your vacation or honeymoon trip to Belize. Belize has so much to offer... an abundant adventurous Rainforest, Mayan ruins, cave tubing, hiking, biking and treking within the unspoiled Belizean interior. Or, if you like diving and snorkeling, they've got the beautiful Carribean right at their door step. So many Caribbean Cayes with names like Chapel, St. George and even Wee Wee that you won't be able to visit them all unless you actually move to Belize. This CD is dedicated to all of Belize! Also for those wanting to buy Belikin beer in the United States, the US or USA then remember that this is the next best thing. Thank you so much for visiting my "drinking Belikin beer" website. This has been an exciting year for me in that my new CD, "Tequila Tonight, Tomorrow We Ride!" has become very popular among those who enjoy folk style rock with a tropical theme. The title track has also been selected to be included on a complilation CD being produced by "Meet The Phlockers" and proceeds from the sale of the CD will be donated to MDA. Additionally, I have been selected by "Bookbag Santa, Inc." to be their official musician for 2010. As such I will be accompanying this nonprofit organization to Belize for charitable causes. I consider this an honor and will do my best to help this organization as best I can. Please see their Link at the bottom of this page to learn more about what they do and how you can help if you care to become involved in a good cause. "Calypso Bertrand Has Left The Marina!" Note: The song, My Carib Girl From Dangriga, was inspired from a day trip tour of the Mayan Ruins Altun Ha and the Maya site at Xunantunich in the heart of the Belizean Rainforest. All of the songs on "What We Belize In" were written in the tin roof cabana - cottage - located behind the Seaview Hotel - Barefoot Beach Belize - on the island of Caye Caulker.